Nonverbal Communication cannot be limited to body language, facial expressions, para language, cultural norms, etiquettes, impressionism and attire only. It’s the broadest domain that includes different entities, techniques, operations and methods to convey wordless messages, indications, signals and clues from source to destination. Without any doubt, tactical rewards are assured after thoroughly studying, discovering potentials of and applying various elements of nonverbal communication in practical life. After successfully exchanging nonverbal messages and decoding them accurately in lesser amount of time, many success stories could be written in an unbelievable manner. 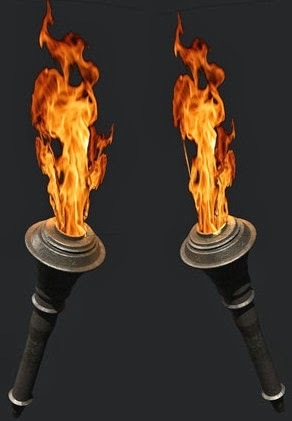 You might know that torches can be used to send messages or signals especially in darkness by waving or moving them symbolically. Perhaps, you’ve might seen people doing so in movies only. What if a King utilizes smoke and cannons to convey encoded messages for achieving something incredible which his enemies cannot think about same at first place? This is what was exactly happening during 17th century in Maratha Empire of medieval India. A great King Chhatrapati Shivaji Maharaj who intelligently studied and utilized different entities for spreading encoded signals to its army and allies scattered miles away from the locations where messages were initiated. This was really a greatest achievement at the time when exchange taking place among individuals located at different geographical locations wasn’t rapid and advanced. Messengers covering distance on their feet and riding on horses or other animals were employed to exchange written and oral messages. Messages were also used to be sent by employing pigeons, hawks or eagles. Still, it used to take hours, days and sometimes months for successful exchange of message from one point to another. There were many hurdles, hazards and physical limitations for exchanging message by these ways. Moreover, it was not assured that a message makes to its destination and person for which it is intended due to of potential interception. Only way was to send some encoded visual or auditory (sounds) messages or signals from one location. Torches can be used to send encoded signals from one point to another but over a certain distance due to limitation of visibility. So what Shivaji and his men did to convey messages that let them to excel in tactical communication? They might have used other entities, methods and techniques but any written evidences haven’t found yet. 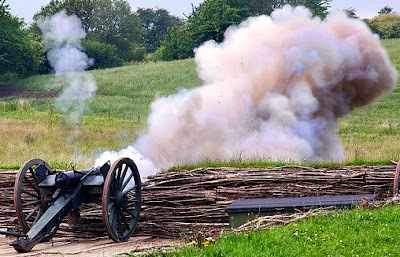 Let’s see how they used colored smoke and sounds generated by firing cannons for signaling. Signals given by firing cannons: Shivaji and his army fought many wars but the battle of Paawan Khind (Khind - a narrow passageway in mountainous terrain) became legendary in war history of Maratha Empire. Also, it’s really interesting to know that how Shivaji could send a crucial signal to his fighting men much quickly in that critical situation. During the secret escape from Panhalgad (a mountainous fort situated near Kolhapur), he and some 600 soldiers headed towards Vishalgad (another mountainous fort) through thick forest at a night with full moon in sky. On their way, they eventually found that enemy troops were pursuing them and getting closer progressively. King Shivaji had to reach on Vishalgad at any cost so Bajiprabhu Deshpande (a legendary warrior) and few men decided stay at Paawan khind and fight with enemy. 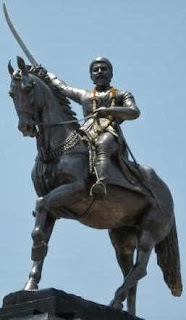 He kindly requested Shivaji and other men to keep moving towards Vishalgad safely. With heavy heart, Shivaji had to keep moving on with his 300 committed men left behind to fight with some 3,000 enemy soldiers. Unlike other kings, the king was deeply concerned about those men who had decided to create barrier between him and enemy troops. After reaching at destination safely, Shivaji couldn’t waste time in attempt of saving lives of gallantry warriors. Paawan khind was located few kilometers away from Vishalgad so he could send messengers on horseback to convey the message. He told them to keep fighting until he doesn’t reach at Vishalgad and fires few rounds of cannon as signal of his successful appearance at the destination. He asked his men to retreat immediately after hearing the sound. Why did he choose only cannons to send them the signal? Crisscrossing hills, forest and valleys were greatest barrier for visual signals. Hence only large and bustling sound could travel the distance and terrain much quickly. That was a true tactically nonverbal message! Even though they were deeply wounded, Shivaji's gallantry soldiers kept fighting with high spirit until they heard the roaring sounds by firing cannons at Vishalgad. Finally, all 300 men including Bajiprabhu Deshpande scarified themselves happily to safeguard the great Maratha Empire. Signals given by colored smoke: Shivaji conquered, built and repaired more than 300 forts as guarding posts of his vast empire that was constantly being spied, invaded and attacked by other empires. As forts were separated from each other over miles, sending audio signals reaching at destination quickly wasn’t possible. Hence he came up with an excellent idea. He ordered the men guarding forts to use smoke for sending signals among forts. Going further, he invented an encoded messaging system by generating colored smoke. 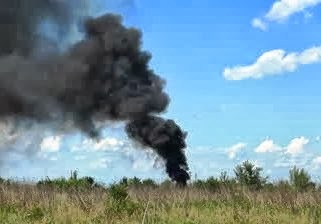 His men discovered trees, bushes and shrubs that could generate smoke in different colors. As it has been found in historical documents, white colored smoke was used to convey positive messages e. g. victory, conquer, allying or expansion of empire. On the other hand, black colored smoke was used to convey negative messages e.g. defeat, retreat, betrayal or death of soldiers. After watching colored smoke rising upward from a fort, guards at different forts used to generate smoke with same color to pass on the message to other forts. Just within few hours or a day, a message initiated from one fort could reach to another which was located hundreds or thousands miles away from first one. Prescribed codes for bodily conduct: Shivaji asked his delegates, representatives and messengers to adopt an upright seating posture in meetings. He also asked them to avoid doing uncontrolled and immature body movements, facial expressions, gestures and eye contacts. According to him, any message to servants should be conveyed through subtle gestures, expressions or emblems only to accomplish the intended tasks. 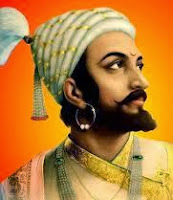 This article is dedicated to the great King - Shivaji Maharaj (Maharaj - a Sanskrit word synonymous to "King"), his gallantry soldiers and intelligence personals. Shivaji was not only a brave Indian warrior to shape the sovereign empire but also a great visionary, engineer, entrepreneur and strategist to inspire many. He was openly appreciated and accredited by many world famous historians, travelers, politicians and academics. Thanks! This is good. Both the use of the cannon sounds and colored smoke were really clever. (Colored smoke is still used in Italy to send messages about the selection of a Pope - did you know?). Language itself seems to have arisen much the same way - except rather than to communicate right away, my thoughts are that language was a means to induce a missed experience in others who could not be there at the time (displaced sensation). Example: if a few members of a clan went on a journey and returned, how would they explain what they saw? First, nonverbally (gestures of mountains valleys, monsters, battles accompanied by rough sounds). Later, the sounds made by human speech became even more explanatory than gestures, so gestures have been partially forgotten as to importance. Like the coding of signals in this article -- they would still work today, just as NVB continues to be used, even if we don't notice it as much as speech anymore.